Claude Monet (1840 – 1926), the founder of Impressionist Movement, was born in Paris. 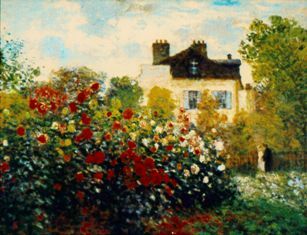 Monet was enrolled in the studio of Glenyre, where he met Renoir, Sisley, and Bazille, who became the core of the Impressionist Movement. By eliminating black and gray from his paintings, Monet was able to represent natural colors like a prism. His works show us the effects of transient light on the various images around us. We hope you enjoy Glassmasters’ interpretation of Monet’s “Artist’s Cottage”.